Laurel, Maryland is a beautiful mid-sized city in-between Baltimore, Maryland and Washington, DC. The city itself has a population of around 20,000. If you add in the outskirts, the population is around 88,000. Laurel was incorporated in 1870 and values its history. Laurel still maintains a historic district that includes Main Street. Here you will find renovated building that keep up the style and architecture of the 1870's There are little shops and restaurants and everyone that visits Laurel also visits Main street. Another main attraction for Laurel, Maryland is their Laurel Park Race Course. This race track had its beginning in 1911 and is a thoroughbred racetrack. Laurel, Maryland may be known to some, because of the senseless shooting of Governor George Wallace in 1972. Laurel has a reputation as a kind city. On August 29, 2005, Laurel Maryland adopted Laurel, Mississippi as its sister city to help with the disaster of Hurricane Katrina. Laurel, Maryland seems to be a popular city to mention in books and movies. Stephen King mentioned Laurel in one of his books and an episode of x-files mentioned Laurel also. 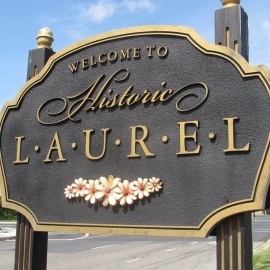 Some famous people have lived in Laurel including former President Eisenhower and his wife in 1918 for 5 months and Ron Turcotte, a famous horse jockey trained at Laurel around 1970. Laurel is a beautiful city with housing prices slightly above the average, the crime is low and the people are welcoming. The Signature Social Event of the year! If you have never been to Derby Day you are in for a treat. For women, this is the day you wear those big hats and bright smiles. The Official Taurus Celebration in the #DMV The annual "Purple And White Event" Saturday May 4th 2019. For more infomation log on to www.djprinceroyal.com. The 2nd annual Jazz and Art Festival is a celebration of creativity and talent!